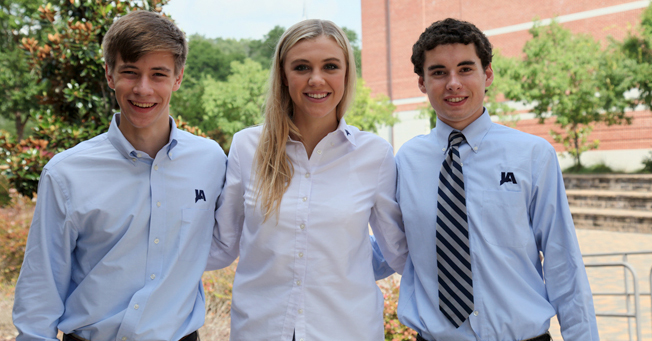 Three JA seniors were selected among “25 Students Who Will Change the World.” The honor is bestowed annually by Portico magazine upon students who demonstrate excellence and make an impact in their schools, communities, and among their peers. College presidents participate in the selection process. Alex Schott named his work with Teen Trendsetters™ his greatest accomplishment to date. In Teen Trendsetters™, Alex tutors and mentors students from a nearby elementary school who are six months behind or more in reading. He has seen students’ interest in reading increase, even finding that his mentees read when school is out for holidays. Alex just returned from Fukuoka, Japan where he played trombone in the Mississippi Lions All-State Band that won the 2016 International Lions Parade Championship. Conley Chinn was selected last spring as Mississippi’s Gatorade Volleyball Player of the Year, joining an elite group of volleyball players from across the country that have been tapped for this honor. Yet in her interview, she focused on how the award would not have been possible without her teammates. “Being named Gatorade Player of the Year was undoubtedly spectacular, but what is even greater is that I really came to understand that it was not just me who won the award, it was my team,” she said. Travis Rogers finds the smiles of campers a measure of his accomplishment when he volunteers at a special needs camp. Counselors’ service to campers varies anywhere from assisting with basic functions such as eating and bathing to working with a talent show in which every camper participates. The entire program is designed so that each camper has a memorable summer camp experience. Travis referenced a quote from Albert Einstein in describing his experience: “Try not to become a person of success, but rather become a person of value.” He has found that the smiles of campers joyfully experiencing camp help him appreciate what Einstein meant.